Roofing & Siding: 28 Gauge Steel. Roof Overhangs: Overhang boxed-in w/ White Vented Soffit w/ Steel Fascia Trim: 12” Sidewalls, 12” Gable Ends w/Uni-Ridge Vent Mesh (Under Ridge Cap). Entry Doors: (1) 3′ 6 Panel – Rot Free Vinyl Jambs & Molding. Sliding Doors: (1) 10’Wx12’H SPLIT (In 24’ Gable) White Frame-Non Insulated w/ Inside Locks. WARNING: Duplicating, Copying, Downloading, Saving any Images for personal use or sharing images with a third party is strictly prohibited and not authorized by TLC. Any infringement will be Intolerable. you can choose when configuring your building. © . Tam Lapp Construction LLC. All Rights Reserved. 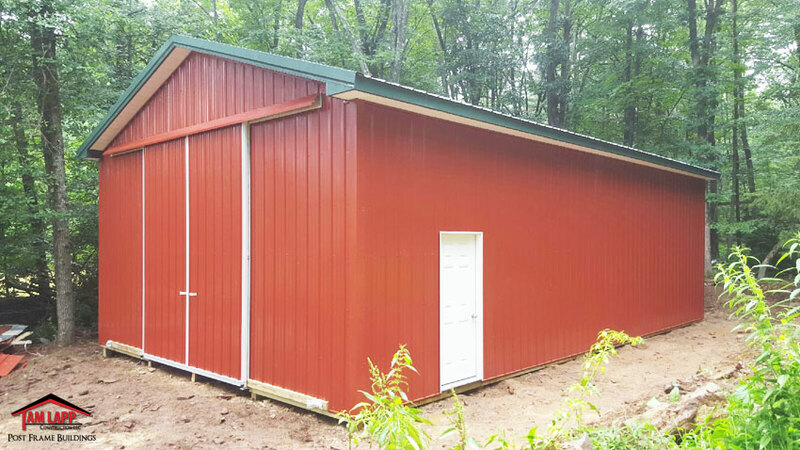 Residential, Commercial & Agricultural Pole Barn Buildings. Get a Free Quote at Tam Lapp Construction, LLC. "Please note that our build schedule is currently at 10-12 weeks once Permits are Obtained"
(We ask for this so we may send you brochures and more helpful Info). If you found us via online search, what words did you search for? Unless this field is filled, this building will be priced as is. TLC does not sell or distribute this info to any third party other than TLC affiliates. ---YesNo : Have you confirmed with your local township & zoning for building size you are permitted to build?